Great article! Thanks for your Microlog improvements. 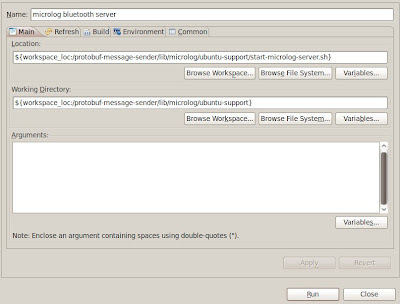 - I guess you are using Ubuntu since you are posing on this blog? - Are you using the 2.1.1-SNAPSHOT of BlueCove? - Are you using 2.0.0-SNAPSHOT of MicroLog? - Please post a few code samples as well that shows how you are using the MicroLog library. I have bluetooth device installed on ubuntu 9.04. I'm usnig bluecove 2.1.1 and followed all instructions. hcitool scan gives the address and name of my device. In addition i'm able to send file from ubuntus to my mobile device via the applet supplied in ubuntus. This might be an issue with the latest snapshot build of Microlog. I will have a look at it. notice that a new version of Microlog is available, that is Microlog V2.1.0. This should contain all the fixes made by Jarle. The GUI has also been improved.